I love Asian-style meatballs. You know, the fish balls or meat balls you often find in noodle soups. They’re delicious. But if you’ve ever seen them at the market, the pre-packaged kind are also full of preservatives. 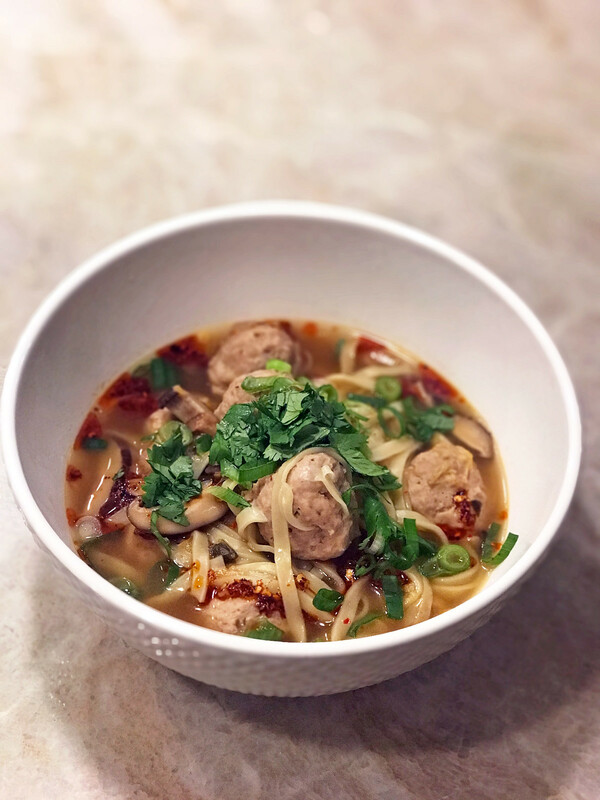 In this soup, I made the meatballs from scratch, using grass-fed turkey and the results were better than the store-bought version. A chicken stock base and a drizzle of chili oil lends flavor to a hearty soup that’s perfect in January. 1. In a bowl, soak the mushrooms in warm water until softened, about 15 minutes. Drain, thinly slice the mushrooms, and set aside. 2. Bring medium-sized pot filled with water to a boil over high heat. Add the noodles and cook according to package instructions. Drain, rinse, and drain again. 3. To prepare the meatballs, put the meat, cornstarch, sesame oil, and salt in a food processor and process to a smooth paste. Scoop the meatball mixture out into a bowl. With wet hands, roll the mixture into walnut-sized balls. Arrange the meatballs on a plate. 4. To make the soup, in a medium pot, combine the broth and the vinegar and bring to a boil over high heat. Add the meatballs and return to a boil. Reduce the heat to medium and simmer until the meatballs are cooked through, about 10 minutes. Stir in the mushrooms and kimchi and simmer for 2 minutes longer. Add the cooked noodles and cook, stirring, until the noodles are heated through. Season to taste with salt and pepper. 5. Ladle the soup into bowls and garnish each bowl with some green onions, cilantro, and chili oil.